Microbes and moisture associated with building materials and structures are known to cause health effects. To understand this phenomenon it is important to know how the indoor environment of a moisture damaged building differs from that of a normal and non-damaged building in terms of microbial concentration. In this context, we have selected index and reference buildings based on the criteria like visible mold, smell of mold and moisture damage to compare indoor microbial concentrations of index buildings with that of reference building. The indoor fungal diversity of index buildings was studied in relation to the reference building. The differences between moisture-damaged and reference building in indoor microbial concentration were studied in total five buildings with methods including microbial air sampling and bulk sampling. The airborne microbes such as bacteria, actinomycetes and fungi were isolated on respective agar plates by using settling plate technique. For the isolation of microbes in the concrete samples, bulk sampling was used. The microbial concentrations were measured in terms of colony forming units (cfu). The studies have revealed that the concentration of bacteria in the indoor environment and concrete samples of index buildings were higher than that of reference building. The concentration of actinomycetes in the indoor environment of IB-1, IB-3 and IB-4 buildings were higher than that of IB-2 and reference building. The high density of fungi in the indoor air and the biodiversity of fungal populations were more conspicuous in the index buildings. The fungus Aspergillus flavus isolated from indoor environment showed the presence of aflatoxins by HPLC analysis. The prevalence of health problems among the occupants of index buildings were compared to that of occupants of reference building. A more noticeable observation was that the distribution of fungal species in moisture affected buildings was possibly involved in cough, sneezing, eczema, and asthma among the occupants in the present studies. From these findings it is concluded that increase in the indoor microbial concentration is attributed to moist conditions in damaged buildings which may have serious impact on human health of residents. Historical buildings, domestic structures, workplace environments, enclosed spaces and tourist structures (caves, church/monastery, and caves etc.) have received considerable attention of various research groups. Buildings which suffer from dampness or moisture often affect structural components of building materials. The surface of the materials such as concrete and ceramic tiles, ceilings, particle or timber boards, steel chambers etc. create specific niches for microbial growth. Wetness is the principal factor that favors growth of microbes on all these surfaces. Moisture in indoor environment is a consequence of a leaky roof, plumbing defects, capillary movement of water in the structures, poor ventilation or insufficient insulation, condensation on windows and subtle surfaces, and humidified air etc. (Nevalainen et al. 1998; Haverinen et al. 1999). Microbial growth can lead to biodeterioration of building structures by both physical and chemical processes (Jones and Wilson 1985; Bjelland et al. 2002). Microbial growth in moisture affected buildings also cause damage to the materials and release of various potentially harmful agents such as microorganisms and their spores, volatile organic chemicals and mycotoxins into the indoor air (Pasanen et al. 1992; Flannigen et al. 1996). Microorganisms related to excessive moisture on building materials includes filamentous fungi (also known as mold), rot fungi, yeast, actinomycetes and bacteria (Flannigen and Miller 1994). Actinomycetes that originate from environmental sources rather than from humans are regarded as moisture indicator bacteria in indoor environments (Samson et al. 1994; Flannigen et al. 1996). In India, Karne and Pande (2006) studied the aero-mycology of allergenic fungal aerobiopollutants over potato fields during kharif season in Satara District, in Maharashtra State. Pande (1999) studied the airborne bioparticles using Tilak Air Sampler in different indoor environments such as vegetable market, cattle shed, textile mill, saw mill in Aurangabad in Maharashtra State. Adhikari et al. (2004) have shown that the culturability of airborne fungi may be associated with adverse health effects on humans as well as plant and animal diseases. Indian agricultural workers could be exposed during handling of various plant materials to airborne biological hazards posing a risk of work-related respiratory diseases. Of these the most important are bacterial endotoxin and allergic species of bacteria and fungi (Traczyli 2005). It is apparent from the literature that the data on microbial concentrations and their long term impacts on human health in the damaged buildings of indoor environment have been rarely discussed. Considering this background, the present study was aimed to enumerate the microorganisms from indoor air and concrete samples of moisture affected buildings; identify the different types of fungi and to examine health status of occupants of moisture affected buildings. Thus the study represents an important strategy in order to understand the role of these microorganisms in enclosed structures under moist conditions that may provide some insight into the exact mechanism through which these organisms cause adverse effects on human health. In the present investigation, laboratories (IB-1 and IB-2), hospital ward (IB-3), residence (IB-4), and unit of library (RB) were selected to meet the following criteria: visible mold, smell of mold and moisture damage and classified as index buildings (IB) and reference building (RB) (Hyvarinen 2002). Moisture and mold damage of the buildings were observed during the survey which included a thorough walk-through to visually observed signs of moisture faults such as signs of water and other factors. In addition, the health status among the occupants of these buildings was examined with a questionnaire (Axelrad 2003). The questions on respiratory problems, allergy to dust, allergy to molds, migraine, eczema, hay fever, leg cramps, headache, nausea, sneezing, dry itching or irritated eyes, etc. were included in this questionnaire. The prevalence of health problems among occupants of index buildings was compared to that of reference building. Here, two types of methods were used for sampling viz the settling plate technique and bulk sampling. In the settling plate technique, the agar plates were exposed to the indoor air for 5-10 minutes. In bulk sampling, surface of moisture damaged wall was scraped using sterile forceps and these concrete materials were transferred in sterile screw-cap tubes (Holme 2006). The weight of collected concrete samples was taken in the previously weighed petri dish. The petri dishes were heated at 110oC for 30 to 45 minutes in an electric oven. The weight of petri plates along with samples were recorded after heating (Howell 1995). The percentage of moisture in the concrete samples was then calculated. The serial dilutions of the collected samples were prepared using sterile saline (0.85 %). Nutrient agar (HiMedia Laboratories Pvt. Ltd.), yeast extract glucose agar (Glucose-5 g, yeast extract 2 g, dipotassium hydrogen phosphate-1 g, agar-15 g in 1000 ml of distilled water, supplemented with 0.01 g of aureomycin, pH 7) and potato dextrose agar (HiMedia Laboratories Pvt. Ltd.) were used for isolation of bacteria, actinomycetes and fungi, respectively. Plates were aerobically incubated at 37oC for bacteria and actinomycetes while the potato dextrose plates were incubated at 30oC. The incubation period for bacteria, actinomycetes and fungi were 24 to 48 hours, 2 to 3 days, 2 to 7 days respectively. After incubation, the concentration of viable microbes in the indoor air and concrete samples were measured in terms of cfu/m3 and cfu/g respectively. The wet mount and slide culture technique were used for microscopic observation of fungi for their identification (Aneja 1993). The fungus Aspergillus flavus was selected for the analysis of mycotoxins. A mixture of acetonitrile: water (84:16) was added to 1 ml of liquid culture, followed by homogenization for 3 minutes, and centrifugation at 1200 rpm for 3 minutes. Then 1 ml of supernatant was taken and passed through Aflaprep column (Water's UV fluorescence 2475) and the eluent was collected in 2 ml Eppendorf tube, filtered through 0.2 µm membrane filter. The filtrate (100µl) was injected to HPLC column. Aflatoxin B2 and G2 (0.1ng/ml) and aflatoxin G1 and B1 (0.4 ng/ml) were used as standards. The HPLC conditions used for the study includes: mobile phase (Water: Acetonitrile: Methanol in 6:2:2 ratio + 119 mg Potassium bromide + 100 µl of 65% nitric acid in one litre), column (Nucleosil C18, 250 mm, 4.6 mm id, 5 µm particle size), Kobra cell (current 200 µA), detector (Fluorescence, excitation: 360 nm, emission: 440 nm), and 0.6ml/min flow rate of mobile phase. Table 1 depicts different characteristics of buildings such as age of the buildings, wall and roof construction, site characterization, site information, gazing elements, operable windows, painting renovations, exhaust fan, air fan, smoking, light, season, ventilation, cooling and heating system, moisture content, temperature, number of occupants, and information about cleaning. Table 2 shows the changes in moisture content of index and reference buildings. Reference building was found to have low moisture content as compared to that of index buildings. The concentrations of microbes such as bacteria, actinomycetes and fungi were measured in indoor air as well as in the concrete samples of the buildings. The airborne concentrations of microbes in the index buildings (IB) were found to be higher as compared to that of reference building and these results were significant at p &lt; 0.05 (Figure 1). In concrete samples of buildings, the microbial concentrations of index buildings were high as compared to that of reference building and statistically significant at p &lt; 0.05 (Table 3). Table 4 shows the biodiversity of fungi in the indoor environment of buildings. The fungi were identified on the basis of colony characters, wet mount and slide culture technique (Figure 2). The most common fungi that were detected from indoor environment of all buildings include Aspergillus flavus, A. fumigates, A. niger, Emericella nidulans, Alternaria alternate, and Penicillium spp. and yeast. The fungal diversity observed in moisture damaged buildings was more than the reference building. In addition, seven fungal genera were found in the index buildings and reference building. The other fungal species recorded in the index buildings includes Curvularia lunata, C. pallescens, Phialophora spp.Helminthosporum spp. and other Aspergillus spp. The fungus Aspergillus flavus was used for the detection of aflatoxin by HPLC (High performance liquid chromatography). Two types of aflatoxins viz B1 and B2 were detected in the fungus which was compared with that of standard aflatoxin. The concentration of aflatoxin B1 and B2 was found to be 283.71 ng/ml and 34.91 ng/ml respectively (Figures 3 and 4[image #8]). The prevalence of health status among occupants was 56 % in the index buildings and 39 % in reference building. Symptoms like migraine, asthma, eczema, hay fever, cough, leg cramps, headache, and nausea were prevalent among occupants of index buildings. However, symptoms such as allergy to dust, allergy to molds, sneezing, dry itching or irritated eyes were common in both the buildings. The common sources of moisture problems are roof leakage, flooding, leaking services, spillage and construction moisture (Lstiburek and Carmody 1994). In the current study, the moisture damage was observed due to poor ventilation in IB-4 where as in case of IB-1, IB-2, and IB-3 moisture content was primarily due to improper plumbing that resulted in leakage and capillary movement of water. The airborne concentrations of bacteria were higher in the index buildings than in the reference buildings. The results obtained in our study are comparable to the findings of a study conducted in homes of Finland (Nevalainen et al. 1989; Ross et al. 2000). Similarly, the airborne concentration of actinomycetes showed significant differences in IB-1, IB-3 and IB-4 buildings with the exception of IB-2. Williams et al. (1989) reported that actinomycetes do not belong to the normal microbial flora in indoor air; however, their spores can resist desiccation and starvation for long periods until moisture and nutrients are sufficient for germination. The airborne fungal concentrations in index buildings were higher than in the reference building. But significant differences were observed only in IB-1 and IB-3 buildings. This is indicative of possible indoor air sources due to the existing moisture which is in accordance with previous studies reported earlier by Klanova (2000). The concentration of viable bacteria in concrete samples of index buildings was higher than in the reference building. However, the bacterial concentration in building material without visible growth was found to be below 4200 cfu/g (Lappalainen et al. 2001). These results suggest that the concentration of viable bacteria seem to very high which can be attributed to the prevailing moisture and environmental conditions in the buildings. The concentration of viable actinomycetes in the concrete sample of index buildings was found to be very high as compared to that of reference building. The concentration of viable fungi in the concrete samples of index buildings was higher than that of reference building and these observations are similar to those reported earlier. Moreover, the occurrence of fungi in the indoor environment in higher concentrations may indicate that the substrates are made available for their growth. These fungi deteriorate the substrates in order to obtain energy. It can be inferred from the findings that moisture damage may change the fungal composition of the buildings which support the earlier conclusion that certain microbes indicate moisture damage (Samson et. al. 1994; Hyvarinen 2002). Pasanen et al. (2000) observed that microbial growth is a complex process regulated by the environmental factors. It is also evident from our studies that the five fungi, namely, Curvularia lunata, C. pallescens, Phialophora spp. and Helminthosporum spp. were found in the indoor air of index buildings but were not observed in the indoor environment of reference building. Arya et al. (2001) studied the occurrence of fungal deteriogens in indoor air of the Baroda Museum and Picture Gallery and biodeterioration of one of the seven unique museum objects. Presence of viable spore of Aspergillus japanicus, A. wentii, Chaetomium atrobrunneum, C. ganglienum and Phoma nebulous in indoor air is noteworthy. These biodeteriogens have the potential to cause plant and animal diseases as well as biodeterioration of cultural property. Aspergillus versicolor, A. terreus, Penicillium sp., Chaetomium gangligeum and actinomycetes Streptomyces griseofavus has been reported with miniature paintings of Baroda museum. Mycotoxins are non-volatile, secondary metabolite of fungi, which may be produced due to competition with other microbes. Betina (1989) has estimated that over 300 mycotoxins are formed by 350 species. Mycotoxins are analysed with thin layer chromatography (TLC), high pressure liquid chromatography (HPLC) or the combination of GC-MS (Burge and Ammann 1999). In this study, HPLC-fluorescence technique was used for analysis of mycotoxins. Here, the concentrations of aflatoxins B1 and B2 in the fungus Aspergillus flavus were found to be 283.71 ng/ml and 34.91 ng/ml respectively. This indicates that A. flavus is the potent producer of aflatoxin B1. Tuomi et al. (2000) analysed 79 bulk samples of moldy indoor finishes from Finish buildings with moisture problems for 17 mycotoxins as well as for fungi that could be isolated using culture medium. Common to most mycotoxins is their acute toxicity, some of them being among the most toxic compounds known e.g. aflatoxins, ohcratoxins, trichothecenes, ergot, etc. (Betina 1989; Hintikka and Nikulin 1998). Humans are exposed to mycotoxins mainly by ingestion of mycotoxin-contaminated food or airborne exposure via mycotoxin-containing spores or other particles in moldy buildings or agricultural environments (Sorenson et al. 1987). Exposure to mycotoxins, especially Stachybotrys toxins in buildings has been associated with adverse health effects (Johanning et al. 1999; Etzel et al. 1998; Jarvis et al. 1998). Singh (2001) reported that mold growth in buildings may affect the health of occupants in many ways and may contribute to Sick building syndrome (SBS) as well as allergy and other environmental health problems. Craner (1999) observed that symptoms such as eye, nose and throat irritation/inflammation, respiratory symptoms like cough and chest tightness, fatigue and popular rash are more common in such situations. Alternaria, Helminthosporum, Cladosporium, Fusarium, Aspergillus, Phoma and Penicillium are representative examples of fungi known to cause health problems (Kuehn et al. 1992). The results of our survey showed that 56% of respondents in index buildings and 39% in reference building showed symptoms like migraine, asthma, eczema, hay fever, cough, leg cramps, headache, cough and nausea were more prevalent in index buildings. Symptoms such as allergy to dust, allergy to molds, sneezing, dry itching or irritated eyes were common among the respondents in both settings. 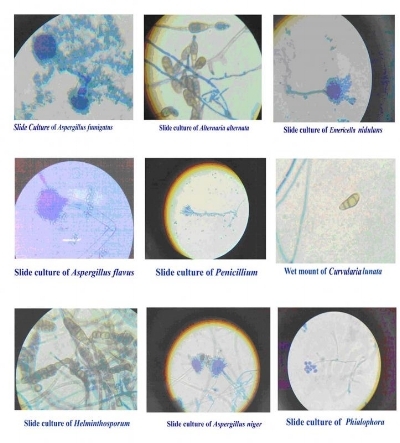 Possibly some of the fungi that were detected in the study like Emericella nidulans, Aspergillus fumigates, Aspergillus flavus, Aspergillus niger, Alternaria alternate, Curvularia pallescens, Curvularia lunata, Penicillium spp., Phialophora spp., Helminthosporum spp. etc. may be involved in showing such symptoms which needs further confirmations. The association between health effects and building related moisture and microbes is well demonstrated, but the causative agents and mechanisms that lead to the symptoms and diseases are still mostly unclear (Bornhag et al. 2001). The association of the respiratory symptoms with the indoor exposure to building related moisture and mold is consistent with previous studies (Dales et al. 1991; Spengler et al. 1994; Koskinen et al. 1997). Meklin et al. (2002) have shown that occurrence of respiratory symptoms among schoolchildren is associated with the moisture and mold damaged school buildings. Review of Kuhn and Ghannoum (2003) concluded that the relationship exits between indoor air, mold exposure, mycotoxins and human disease. The aerobiological survey was carried out in indoor and outdoor environments at 76 hospitals in Amravati. Out of all the hospitals examined maternity and children hospitals showed highest (50.68 %) bacterial isolates which are pathogenic to human beings (Tambekar et al. 2007). Sharma et al. (2008) showed that some of the indoor fungus, pollens and dust mites could be responsible for eliciting allergic responses in patients due to the increase in concentrations of indoor bio-pollutants. Further studies may provide more insights to address specific issues of indoor mold-related illness on residents. In conclusion, it can be surmised from the study that the distribution and abundance of air microflora in the affected buildings is a consequence of moisture and other environmental conditions. Moisture damage is the principal factor that may change the fungal composition of the buildings. An increase in the indoor microbial concentration in these settings may have serious impact on human health of residents. The authors are grateful to Professor Bhagyanarayana, Mycology Division, Department of Botany, Osmania University, Hyderabad for identification of the fungal isolates. 1. Aneja K.R. (1993) Experiments in microbiology, plant pathology, and tissue culture. Wishwa Prakashan, New Delhi. 2. Adhikari A. et al. (2004) Airborne viable non-viable and allergenic fungi in a rural agricultural area of India: a 2-year study at five outdoor sampling stations. Science of the Total Environment 326, 123-141. 3. Arya A. et al. (2001) Indoor aeromycoflora of Baroda museum and Egyptian mummy. Current Science 81(7), 793-799. 4. Axelrad et al. (2003) A standardized EPA protocol for characterizing indoor air quality in large office buildings. Indoor environments division, office of radiation and indoor air, U.S. Environmental Protection Agency, Washington. 5. Betina V. (1989) Mycotoxins, chemicals, biological and environmental aspects. Bioactive molecules, volume 9. Elsevier, Amsterdam, Netherlands, 438. 6. Bjelland T. et al. (2002) The occurrence of biomineralization products in four lichen species growing on sandstone in Western Norway. Lichenologist 34, 429-440. 7. Bornhag G. et al. (2001) Dampness in buildings and health. Indoor air 11, 72-86. 8. Burge H. and H. Ammann (1999) Fungal toxins and β-(1-3)-d-glucans. In: Bioaerosols, Assessment and control. Macher J. (Ed. ), ACGIH, Cincinnati, Ohio, USA 24-1 - 24-13. 9. Craner J. (1999) Building-related illness in occupants of mold-contaminated houses. In: Bioaerosols Fungi and Mycotoxins. Eastern New York Occupational and Environmental Health Center, Albany. 146-157. 10. Dales R. et al. (1991) Respiratory health effects of home dampness and molds among Canadian childrens. Am J Epidemiol 134(2), 196-203. 11. Etzel A. et al. (1998) Acute pulmonary hemorrhage in infants associated with exposure to Stachybotrys atra and other fungi. Arch Pediatr Adolesc Med 15, 757-762. 12. Flannigan B. and D. Miller (1994) Health implications of fungi in indoor environments-an overview. In health implications of fungi in indoor environments. Elsevier Science, Amsterdam, 1-28. 13. Flannigan B. et al. (1996) ISIAQ Guideline, Taskforce I: Control of moisture problems affecting biological indoor air quality. International Society of Indoor Air Quality and Climate, Espoo, Finland, 70. 14. Haverinen U. (1999) An approach to management of critical indoor air problems in school buildings. Environ Health Perspect 107(3), 509-514. 15. Hintikka L. and M. Nikulin (1998) Airborne mycotoxins in agricultural and indoor environments. Indoor Air 4, 66-70. 16. Holme J. (2006) Detection, assessment, and evaluation of mould in buildings in relation to indoor environment and effects on human health. Report from the Rand D-programme-Climate 2000. Norwegian Building Research Institute. 17. Howell J. (1995) Moisture measurement in masonry: Guidance for surveyors. The Royal Institution of Chartered Surveyors, 145-148. 18. Hyvarinen A. (2002) Characterizing moisture damaged buildings-Environmental and biological monitoring. Academic Dissertation, National Public Health Institute, Finland. 19. Jarvis Q. et al. (1998) Study of toxin production by isolates of Stachybotrys charatum and Memnoniella echinata isolated during a study of pulmonary hemosiderosis in infants. Appl Environ Microbiol 649(10), 3620-3625. 20. Johanning E. et al. (1999) Clinical experience and results of a sentinel health investigation related to indoor fungal exposure. Environ Health Perspect 107(3), 489-494. 21. Jones D. and J. Wilson (1985) Chemical activity of lichens on mineral surfaces-a review. International Biodeterioration 21(2), 99-104. 22. Karne A. and B. Pande (2006) Aero-mycological study of allergenic fungal aero-biopollutants over potato fields. Poll Res 25(3), 525-530. 23. Klanova K. (2000) The concentrations of mixed populations of fungi in indoor air: rooms with and without mould problems; rooms with and without health complaints. Cent Eur J Publ Health 8(1), 59-61. 24. Koskinen O. et al. (1997) Two moldy day-care centers: a follow-up study of respiratory symptoms and infections. Indoor Air 7, 262-268. 25. Kuhn D. and M. Ghannoum (2003) Indoor mold, toxigenic fungi, and Stachybotrys chartarum: infectious disease perspective. Clinical Microbiology Reviews 16(1), 144-172. 26. Kuehn K. et al. (1992) Identification of airborne micro-fungal population from home environments within Dallas Fort Worth (Texas) region. Indoor Environment 1992, 285-292. 27. Lappalainen S. et al. (2001) Evaluation priorities for repairing in moisture-damaged school buildings in Finland. Build Environ 36, 981-986. 28. Lstiburek J. and J. Carmody (1994) Moisture control handbook. Principles and practices for residential and small commercial buildings. John Wiley and Sons, Inc., USA. 29. Meklin T. et al. (2002) Indoor air microbes and respiratory symptoms of children in moisture damaged and reference schools. Indoor Air Suppl. 4, 45-49. 30. Nevalainen A. (1989) Bacterial aerosols in indoor air. Publications of the National Public Health Institute A3, Kuopio University Printing Office, finland, Phd thesis. 31. Nevalainen A. et al. (1998) Prevalence of moisture problems in Finnish houses. Indoor Air 4, 45-49. 32. Pande B. (1999) Airborne microbial population in different localities at Aurangabad. Dr. B.A.M.U. Journal of Science 6, 73-78. 33. Pasanen L. et al. (1992) Occurrence and moisture requirements of microbial growth in building materials. Int Biodeter Biodegradation 30, 273-283. 34. Pasanen L. et al. (2000) The relationship between measured moisture conditions and fungal concentrations in water-damaged building materials. Indoor Air 11, 111-120. 35. Ross A. et al. (2000) Association of asthma symptoms and severity with indoor bioaerosols. Allergy 55, 705-711. 36. Samson R. et al. (1994) Recommendations In: Health implications of fungi in indoor environments. Elsevier Science, Amsterdam, 529-538. 37. Sharma D. et al. (2008) Pollen fungus and house dust mites survey at the residence of 90 allergic patients in Greater Silchar area of Assam, India. Research Journal of Allergy 1(1), 1-11. 38. Singh J. (2001) Occupational exposure to moulds in buildings. Indoor and Built Environment 10, 3-4. 39. Sorenson G. et al. (1987) Trichothecene mycotoxins in aerosolized conidia of Stachybotrys atra Appl Environ Microbiol 53(6), 1370-1375. 40. Spengler J. et al. (1994) Respiratory symptoms and housing characteristics. Indoor Air 4, 72-82. 41. Tambekar D. (2007) Studies on environmental monitoring of microbial air flora in the hospitals. Journal of Medical Sciences 7(1), 67-73. 42. Traczyli E. et al. (2005) Exposure of Indian agricultural workers to airborne microorganisms, dust and endotoxin during handling of various plant products. Ann Agric Environ Med 12, 269-275. 43. Tuomi T. et al. (2000) Mycotoxins in crude building materials from water-damaged buildings. Appl Environ Microbiol 66(5), 1899-1904. 44. Williams T. (1989) Genus Streptomyces. Waksman and Henrici 1943, 399AL. In S.T. Williams, M.E. Sharpe and J.G. Holt (Eds.). Bergey′s manual of systematic bacteriology Vol 4, 2452-2492). Baltimore: Williams and Wilkins.